The Large Type Edition of Christian Prayer is the official one-volume edition of the internationally acclaimed Liturgy of the Hours. 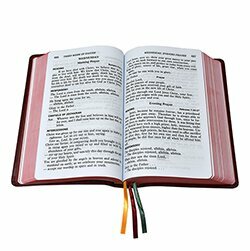 This version of Christian Prayer contains the complete texts of Morning and Evening Prayer for the entire year but not music or the Office of Readings. Does include the Large Type Editions of the current St. Joseph Guide for Christian Prayer and Inserts for Christian Prayer. Printed in large, easy-to-read 14-pt. type, this book includes handy ribbon markers and is bound in flexible maroon simulated leather. Size: 5-1/2" x 8-1/4" H - 1,600 pgs.